Wonder, wonder. A woman fed up of being with humans says she has married a ghost. The woman, who had five children with her human husband, said she was fed up with human failings and has opted to marry a ghost. It was her latest attempt at finding a perfect mate, she said. Her new husband was a Haitian pirate who told her he was black with jet black hair, and was executed for his crimes in the 1700s. 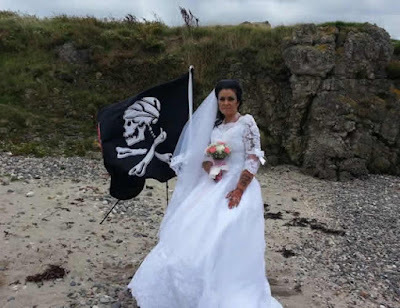 Forty-five-year-old Amanda from Downpatrick in Northern Ireland, believes their pirate connection is what brought them together – first as friends, before she developed ‘strong loving feelings’ towards him. Amanda, a female Jack Sparrow impersonator, said: “We became really close; the more I learnt about him, the more I liked him. "One day, he said to me ‘We can actually be together you know?’ but I had never heard of an intimate relationship between a spirit and a human before. “We became really close, and, the more I learnt about him, the more I liked him. Jack, who never married during his life according to Amanda, is a powerful spirit who can turn stereos and lights on and off, and move things. “I told him I wasn’t really cool with having casual s*x with a spirit and I wanted us to make a proper commitment to each other. “If I am going to be in a long-term relationship with somebody, I have the right to be married,” she said. For their wedding, the couple ventured into international waters where their union would be legal, on a boat that allowed 12 of their closest friends and family on board for the ceremony. They used a medium to allow Jack to say ‘I do’, and used a skull and crossbones flag to represent him. Amanda claimed that s*x with a spirit is surprisingly similar to s*x with a human. She added: “It is well known that people often feel a spirit touch their hands, their face or their hair. “The only difference with having a s*xual relationship with a spirit is obviously that sense of touch goes a lot deeper.